‘I came in to work at around 8pm to help lock up for the night. She was sitting eating with one of her sons. I went to the toilet and when I came out there was a pool of sick on the floor. It must have been them,’ the owner told the Sunday People. ‘I approached them and said, “Why didn’t you do it in the bin?” It was right there. 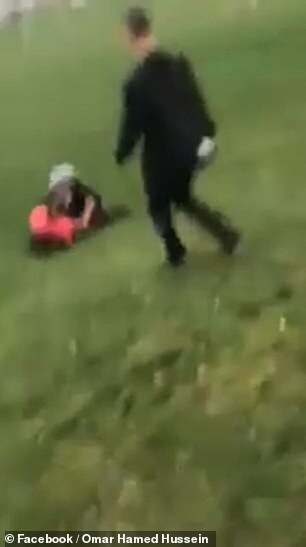 The owner posted the footage to Facebook, which helped police identify the woman and track her down. He said it went viral with thousands of views and that it took two months for the woman to be charged by police. She was hauled before a court last November where she admitted racially aggravated threatening behaviour and was fined £162. 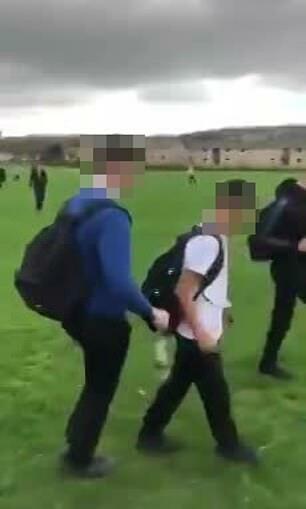 The boy made headlines this week after he was filmed allegedly strangling refugee Jamal and pouring water over his face on playing fields at Almondbury Community School in Huddersfield, West Yorkshire. 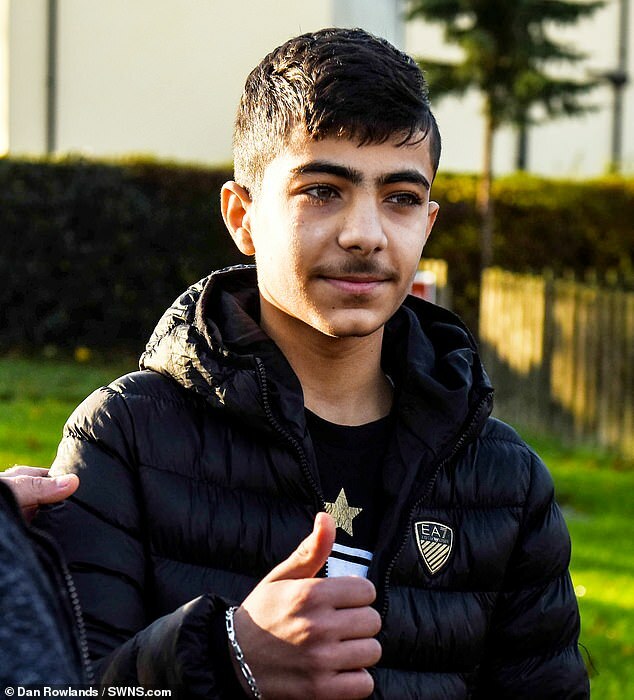 The 16-year-old claimed he had not been bullying his classmate before the incident and was previously on ‘good terms’ with him. 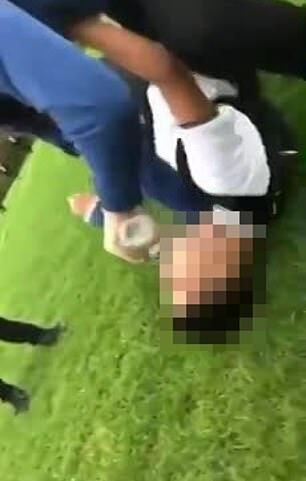 A sickening video showed the 15-year-old being set upon by an attacker who dragged him to the floor and said ‘I’ll drown you’ before pouring a bottle of water on his face as others watched on. Thousands flocked to support the teenager and bemoaned how he escaped war-torn Homs only to be abused by youngsters in the UK. The boy, who escaped war torn Syria with his parents and sister, has suffered two years of bullying since they arrived in Huddersfield. Now they want to leave the town and start a new life somewhere else because the level of abuse has got too much. 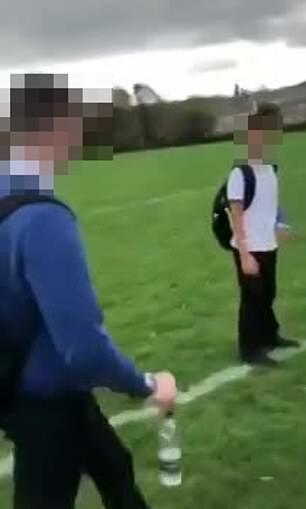 So far more than £135,00 after a shocking video of an assault on the boy went viral, showing him being pinned down by his attacker, and water squirted in his face. 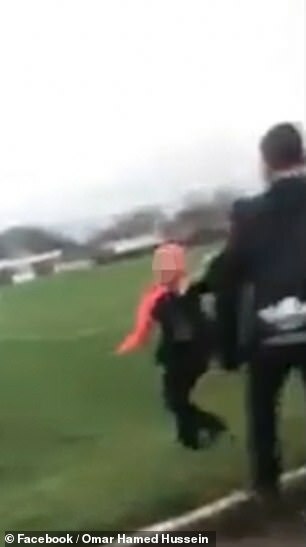 Later it was claimed his sister had also suffered bullying and had her headscarf ripped off in a school playground attack. The family’s lawyer says they are ‘extremely grateful’ for the amount raised, but will be using it to move out of their home. Mr Akunjee told the MailOnline: ‘They will be using this money to relocate from Huddersfield. They don’t want to live there anymore, the level of abuse the children have received has become too much. ‘It is early days on exactly where they will relocate to, but I have been advising them that they need to think about that now.